Does it works with Genn/Baku power? If you copy Build-A-Beast with this as a non Hunter class it will still discover only neutral and Hunter beasts. Makes sense, since they have lists from which beasts r being pulled constructed manually. Not dynamically based on each class' class cards. This card should be moved to the Classic set, it's THAT cool. Hey everyone, just wondering that this card, that was never really used: Sideshow Spelleater could be really good in the next expansion of Knights of the Frozen Throne in wild mode, or, at least, be a really fun card to use. Sure, we don't know yet how every "Death Knight" class hero power will be. But sure looks promising. 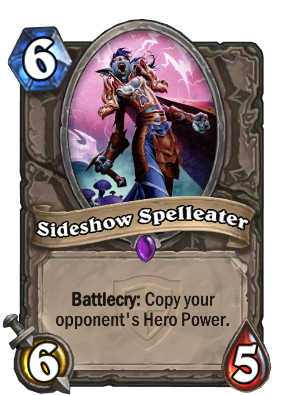 i could see a Highlander deck in wild running Reno Jackson,Kazakus and more interesting, Raza the Chained in priest, along with cards like Garrison Commander to use the new Hero Powers stolen by Sideshow Spelleater in the best way possible !!! The second there appears deck in meta which only aims to get new op hero power this rotates out. I get the reasoning, but now we lack hero power counter tech cards. This card would have been nice in the new standard vs Taunt Warrior. Where does it say that finley has to be played on turn 1? You can play him at any point in the game, combo him with other cards and choose your hero power, instead of getting stuck against rougue or a mirror match. I just got this golden card for rank reward. Disenchant or keep? It seems that blizzard made a card that should be fun and overpowered, but is actually terrible because they preemptively nerfed it so it isn't any fun. from my viewpoint, its completely useless as it stands. Equip a 1 2 dagger. Steal the hero power you already have from your oponent. Does this card work yet? Too bad it's not 6/6 but nvm Sir Finley Mrrgglton is just better. but u cant get tank up with Sir Finley Mrrgglton morover INFERNO! !